On 28 June 2012 the INS organized a Roundtable meeting in honour of parting Deputy Minister of Indonesia Mr. Umar Hadi, who had become Director to the Western Europe Department of the Ministry of Foreign Affairs in Jakarta. The Roundtable, chaired by dr. Willem van Eekelen had as title ‘Indonesia and the EU (and the role of the Netherlands)’. Umar Hadi, a career diplomat, served as Director for West Europe Affairs at the Ministry of Foreign Affairs (2012-2014), Director of Public Diplomacy (2005-2009) and Deputy Director at the Office of the Foreign Minister (2001-2005). 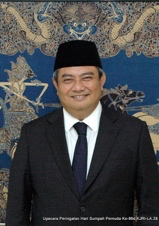 His overseas posts include Minister Plenipotentiary and Deputy Chief of Mission at the Indonesian Embassy in The Hague, The Netherlands (2009-2012) and Second Secretary at the Indonesian Permanent Mission to the United Nations and other International Organizations in Geneva (1996-2001). He has also been involved in numerous negotiations and international conferences. Umar Hadi now  is assigned in Los Angeles and besides sits at the Board of Governors/Advisors of the Institute for Peace and Democracy, the implementing agency of the Bali Democracy Forum, since its inception in 2008. He also organized series of meetings of the Global Inter-Media Dialogue, an Indonesia-Norway joint initiative to promote inter-cultural understanding. He initiated groundbreaking collaborative projects between the Foreign Ministry and civil society organizations, among others in establishing the International Conference of Islamic Scholars and the Asia-Pacific Regional Dialogue for Interfaith Cooperation. Umar Hadi studied at the Fletcher School of Law and Diplomacy (Medford, USA), the Graduate Institute of International and Development Studies (Geneva, Switzerland), and the Padjadjaran University (Bandung, Indonesia). 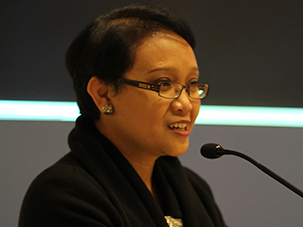 Umar Hadi has written, co-authored and edited few publications, including: “Islam in Indonesia: A to Z Basic Reference” (2009), “Indonesia and World Peace” (2008), “Indonesian Masterpieces at Home and Abroad” (2008), and “The Linggajati Conference: A History Book for Children” (2007).